Outdoor Edge Sharp-X Knife Sharpener. 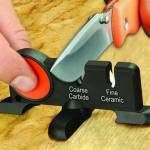 A pivoting X-Base ceramic and carbide knife sharpener. 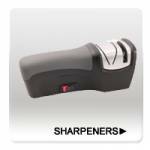 The ultimate compact 2-stage sharpener for outdoor and kitchen knives. Features coarse-carbide for reshaping the blade and fine-ceramic rods for finishing. Designed with an innovative X-Base that pivots for stability and folds flat for storage. .. This unique sharpening tool was specifically designed to quickly and safely sharpen any tool with a long working edge such as axes hatchets machetes shovels lawn mower blades and garden tools. 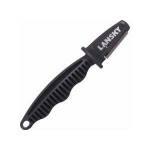 The Lansky Axe & Machete Sharpener features a comfort grip for secure handling and built in hand guard to keep your hand safely away from the blade while sharpening. ..